How long does it take to deposit my funds? What withdrawal options do you have? Are there any withdrawal fees? 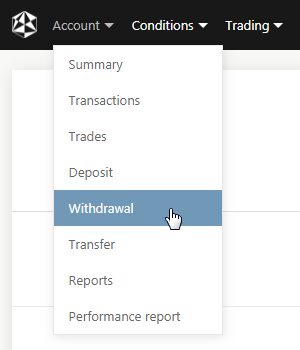 What is the minimum withdrawal level? The minimal initial funding level depends on the type of client account, which can be either individual or corporate. Minimal initial funding for an individual client is 10,000 euro, while minimal initial funding to open a corporate account is 50,000 euros in any of the 8 currencies (EUR, USD, GBP, CHF, JPY, AUD, CAD, RUB) available at EXANTE account. Once your account has been approved and opened, you can add any amount: there are no fixed minimal or maximal deposit limits. All fundings can be made via wire transfer directly to your EXANTE account, which is the safest way of working with large sums of money. Once you made a transfer, you can contact us to confirm that the funds have been received. Please note that it may take from 1 to 5 business days for the bank to process your transfer. Your payment reference shall contain your account number and your full name. You can add other information if that is required by your bank or local authority. Currently the default deposit/withdrawal payment method is bank transfer. The reason for this is that wire transfer is the safest way how to transfer large amounts of money. Also, most payment systems do not allow making large payments. You can fund your account in EUR, USD, AUD, CAD, CHF, CNY, GBP, HKD, JPY, MXN, NOK, PLN, RUB, and SEK, and these funds will remain in the original currency until you intentionally convert them. Please note that the minimum initial sum required to open an account can be deposited in any of the currencies mentioned above. The sufficiency of funds will be determined according to the official exchange rate on the day. The final list of available currencies depends on the account type, the country you're from, and some other conditions. You can fund your account in EUR, USD, AUD, CAD, CHF, CNY, GBP, HKD, JPY, MXN, NOK, PLN, RUB, and SEK. If you want to fund your account in a different currency please contact us at support@exante.eu. The final list of available currencies depends on the account type, country you're from, and some other conditions. EXANTE has opened a multi-currency account for you. You can fund your account in EUR, USD, AUD, CAD, CHF, CNY, GBP, HKD, JPY, MXN, NOK, PLN, RUB, and SEK, and these funds will stay on your account in original currency. 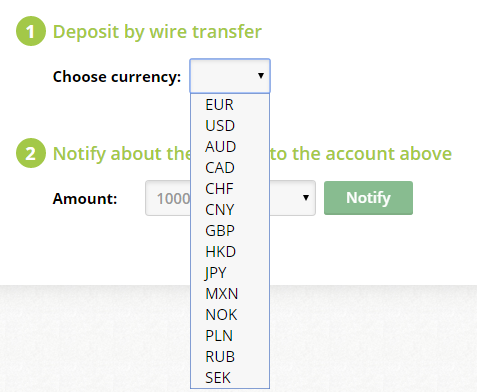 You can also enable automatic conversion to the one of the following currencies: CZK, HUF, NZD, SGD, THB, TRY, or ZAR. That lists are subject to change. Please contact us at support@exante.eu if you want to fund your account or store your funds in a different currency. First of all, we wanted to let you know that the fees we charge are for real trades. We do not have a minimum transaction size. You can trade any number of instruments starting from one traded unit. The size of the minimum traded unit varies by instrument. You can see the specific value on EXANTE’s trading platform in an Instrument Info window. We have a fee for withdrawing funds – it’s 30 EUR/USD/GBP depending on a withdrawal's currency. It does not matter how many instruments or funds are stored in it: having an account with EXANTE is absolutely free. An inactivity fee charges monthly from the accounts that did not perform any trading activity within the latest 181 days, do not have any open positions at all and have balance less than €5000. The empty accounts with the balance less than €100 may be closed after two years of inactivity. Please keep in mind that some charges may arise before the money reaches your EXANTE account: they can be applied by the issuing, intermediary and/or beneficiary bank that process wire transfers. Please contact your bank if you are not sure about transfer costs. If you are looking for information about EXANTE's trading fees, check here: What are the fees you charge for trades? As a Maltese company, we work under MiFID (Markets in Financial Instruments Directive) that is aimed to guarantee the financial security of our cooperation with clients. Moreover, EXANTE is fully licensed in accordance with Мalta Financial Services Authority regulations, which ensures we stick to the STP model in our work. This model means that exchange trades should be conducted directly without participation of third-parties, while other trades should necessarily be routed by Tier 1 liquidity providers. In case of bankruptcy, all our investors will receive all their assets back in full. This is guaranteed by our licensing conditions, which make us separate clients’ assets from our own and store the former on segregated accounts in more than 50 major banks throughout the world. EXANTE has no direct access to clients’ assets. EXANTE works with a number of major European banks. When it comes to clearing, we work with a wide range of Tier 1 liquidity providers, and we have several counterparties for each financial instrument to ensure flawless reliability. As for commodities trading, such deals are executed directly at the corresponding exchanges. The actual amount of time once funds arrive at the client's bank account depends on the currency of the account and the client's bank. Usually, it does not take more than 2-3 bank working days. At the moment, the only option to withdraw funds is through a wire transfer as its the most secure and safe way to transfer significant amounts of money. To withdraw your funds, please log into the Client’s area, navigate to the ‘Account’ tab and select ‘Withdrawal’. Fill out the withdrawal form appropriately and press ‘Send withdrawal request’. You can either specify the amount you would like to withdraw or take out all of your funds completely. If you have any open positions you will see a warning message reminding you to close them first. You can choose any available currency from the dropdown list. Multicurrency balances will be automatically converted to the withdrawal currency. The withdrawal commission is 30 EUR/ 30 USD/ 30 GBP, depending on the currency. In case of insufficient funds lest in the account, the commission will be deducted from the amount being withdrawn. To confirm your withdrawal request, we will either ask you to use 2-step authentication (by using Google Authenticator or SMS) or send you an SMS code to the phone number you have entered as the contact one. You don’t have to print and sign any paper forms! If the code is correct, a message will appear at the top of the screen. It usually takes one business day to approve a withdrawal request. Please note: bank processing may take up to 5 business days and/or require additional fees which are not determined by us in any way. The only funds withdrawal option we offer at the moment is wire transfer. This is the safest way to transfer significant amounts of money around the world. The withdrawal fee is always given in the currency you choose for funds withdrawal. Please note that some additional fees may be charged by intermediary banks when money is transferred to a non-European bank. Unfortunately we cannot affect the size of such fees, or guarantee that they will not arise. EXANTE on its part does not limit the amounts our clients can withdraw from their accounts in any way. There is no minimum amount for withdrawal, while the maximal amount is naturally limited by the amount of free funds currently available on the account. Do not forget about the withdrawal fee, however: sometimes it might be sensible to adjust the withdrawn amount. Usually, it takes not more than 24 hours to approve your withdrawal for execution. Afterwards, it may take 3 to 5 business days for funds to be transferred by the bank to your account.